Weekly Bible Study meets on Wednesday evenings at 7:00 p.m. in the church hall. If you are running low on offertory envelopes, please let Fr. Glenn know and he will make them available to you. There is a sign-up sheet in the hall for those who wish to bring goodies, food, or snacks for our fellowship time after the Sunday service. For the first and third Sunday of the month, snacks will be provided by St. Barnabas. St. Barnabas offers a free taxi service for those who may have difficulties getting to church on Sunday, especially in the winter months. To order the taxi, call Diamond Taxi at 306-693-3999 and make the arrangements for the taxi to pick you up and take you back home after church. You would be responsible for a tip for the driver if you so choose. We currently share a facility with Central Lutheran Church. The building was constructed in 1928 and features several large, beautiful stained-glass windows. Overall, the facility is warm and inviting. We enter the facility each week just as the congregation of Central Lutheran is finishing their coffee time. This allows for great fellowship between both groups. The building itself is wheelchair accessible, with a slight ramp leading to the front door. Parking is available at the rear of the building, accessible through the back lane. There is also plenty of street parking on Hochelaga St. W. Although these are metered spaces, the city of Moose Jaw does not require that parking be paid for on Sundays. The sanctuary is large and inviting. There are no kneelers but the pews are padded. Ample seating is available. There are eight steps up to the chapel. For those with accessibility concerns, an elevator is available. There are two washrooms — one on the main floor and another in the basement. The kitchen is large and features two ovens and an industrial dish washer. After each service we gather for coffee and conversation in the large hall. On special occasions we have lunch. Many of our parishioners enjoy this aspect of parish life. The hall also allows our younger parishioners to partake in a Sunday School service. The kids enjoy lessons and crafts. As well, there is a play room just off the chapel that is perfect for parents to sit with fussy children. Feel free to bring your young ones with you to a service! 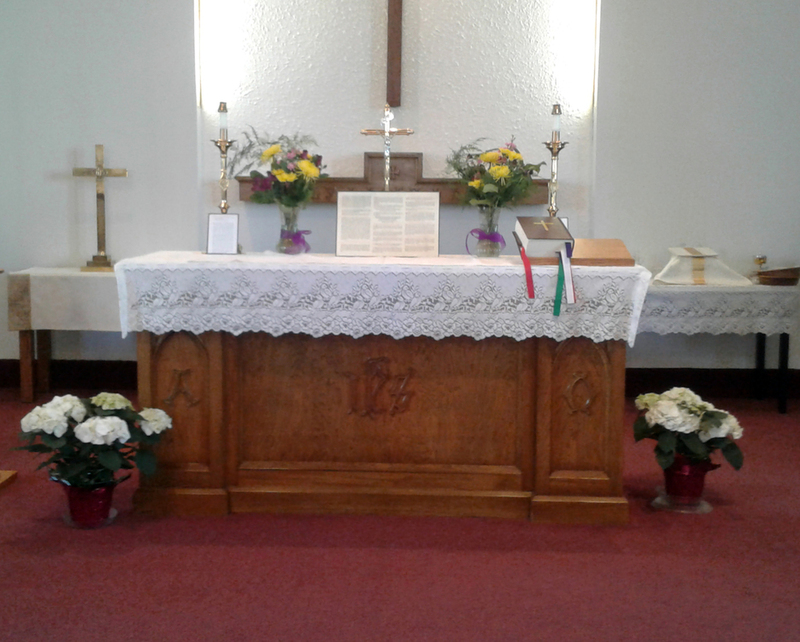 Central Lutheran is located at 27 Hochelaga St. W. We hope to see you there and look forward to worshiping with you!